Guy L. Warden & Sons has always been green. Ever since our beginning we have been concerned with our environment doing our part to preserve it for future generations. It’s not a coincidence that our company color has always been green. We strive to provide products and services to maximize energy efficiency, reduce pollution, and conserve natural resources. One way we accomplish this is through energy audits that lead to tighter control on processes. More efficient processes reduce chemical, water, and fuel usage, lowering overall operating costs and putting less strain on our environment. Energy Conservation: Reducing the energy consumed, we lower emissions leading to a healthier environment for future generations. Lower Cost: It’s not just good for the environment. It’s good for the pocketbook. In the process of lowering emissions, we lower fuel, water, and chemical consumption, all items that add up in operating costs. Responsibility Through Education: Warden believes we all share the responsibility of taking care of our environment. That is why we offer extensive training seminars to teach our customers on how to stay on top of their own energy usage. Relationships: Through efforts to help create more responsible energy use, Warden has forged many relationships. 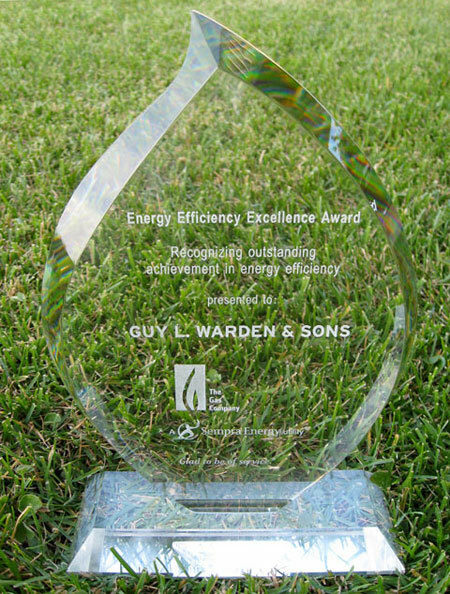 Our work in energy savings has earned us recognition from many customers, organizations, and local utilities. For more information or to schedule an system audit for your facility, please contact us.